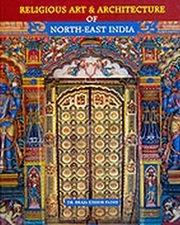 Religious Art & Architecture of North East India by The book deals with the religion, art, architecture of various religious places belonging to Jainism, Buddhism, Hindu temples of Vaishnavism, Saivism, Shaktism, etc., Churches, Mosques. It contains seven chapters. The Chapter first analysises a short note on the southern zone interlinked with history of art and architecture of Orissa. The Chapter II is devoted to religious places of Jainism, Jain heritages, Jain sculptures and monuments etc. In Chapter III precious Buddhist sculptures, Buddhist places etc. in details. In Chapter IV Brhamnical Hinduism is incorporated along with growth and developments of temple architecture iconography/sculptures of Vishnu, Jagannath, Krishna, Rama, Hanuman, Saiva, Sakta, Ganesh, Panchayatana sects are discussed with special references of icons. In Chapter V an out line of the Art heritage of Churches is dealt with all its branches. In Chapter VI is devoted to outstanding works on Mosques Anjumans, Idgahas are dealt. The last Chapter deals with conclusion where some typical notes are given to high light the subject. Braja Kishor Padhi earned name and fame for his out standing participation in viz. Archaeological Survey and Investigation of Kumarsuni Valley of Ganjam district of Orissa during 1999-2000, 2000-2001, 2001-2002. He is equally famous or his decade long active involvements with the Archaeological Survey and Investigation, Excavation, conservation of these archaeological sites of Orissa. Besides a large number of monuments in Orissa were renovated beautified and conserved under his pursuance, care and supervision. He is also responsible for his discovery of viz. Mortar Temple belonging to Tenth Century A.D. near Kharida village in the district of Ganjam. He has in his credit over 200 Research papers on Art, Architecture, Inscriptions, Caves, Excavation and Conservations of Monuments etc. published/preserved in different journals and national seminars. He has visited places to study the iconography of temples, monuments, art and architecture of different parts of India. His book viz. Prastara O' Bhitti Chitrakala' (in Oriya) have received admiration from various corner. The present volume would also be beneficial to the students and scholars.